Florida Oceanographic Society’s 2018 Coastal Lecture Series kicks off on January 8th with an eye-opening presentation by Dr. Steve Davis, wetland ecologist with the Everglades Foundation. 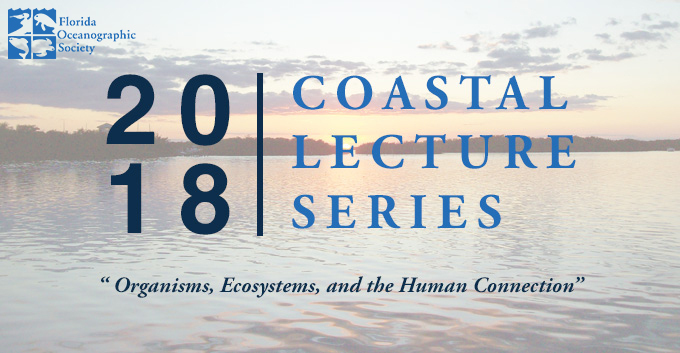 This year’s theme is “Organisms, Ecosystems, and the Human Connection.” Join us for eight exciting and thought-provoking environmental lectures featuring topics relevant to everyone living in our coastal communities. These free lectures are held at the Blake Library in Stuart on select Mondays from January through March. Find out how Florida’s treasured Everglades and Florida Bay are holding up despite a constant attack from drought, flooding, hurricanes, seagrass die-offs and algal blooms.